By Friday, January 29, Palestinian journalist Mohammed al-Qeq had spent 66-days on hunger strike in Israeli jails. Just before he fell into his third coma, a day earlier, he sent a public message through his lawyers, the gist of which was: freedom or death. Al-Qeq is 33-years of age, married and a father of two. Photos circulating of him online and on Palestinian streets show the face of a bespectacled, handsome man. The reality though is quite different. “He’s in a very bad situation. He fell into his third coma in recent days, and his weight has dropped to 30 kilograms (66 pounds),” Ashraf Abu Sneina, one of al-Qeq’s attorneys, told Al Jazeera. Al-Qeq was arrested under yet another notorious Israeli law called the ‘administrative detention’ law. Ominous predictions of al-Qeq’s imminent death have been looming for days with no end in sight to his elongated ordeal. Unfortunately for a man who believes that the only tool of defense and protest he has against apartheid Israel is his body, the Red Cross and other international groups took many days to so much as acknowledge the case of this news reporter who had refused food and medical treatment since November 24, 2015. Al-Qeq, works for Saudi Arabia’s Almajd TV network and was arrested at his home in Ramallah on November 21st. In its statement, issued more than 60 days after he entered into his hunger strike, ICRC described the situation as ‘critical’, unequivocally stating the reality of Al-Qeq’s “life being at risk.” On January 27, the European Union also expressed its view of being “especially concerned” about al-Qeq’s deteriorating health. Under the ‘administrative detention’ law, Israel has affectively held Palestinians and Arab prisoners without offering reasons for their arrests, practically since the state was founded in 1948. In fact, it is argued that this law which is principally founded on ‘secret evidence’ dates back to the British Mandate government’s Emergency Regulations. After Israel occupied the West Bank, Gaza and East Jerusalem in 1967, it clutched at straw in its desperate efforts to find whatever legal justifications it could for holding prisoners without trials. These efforts were eventually articulated in the Israeli Law on Authorities in State of Emergency in 1979. This law was some sort of compromise between the internal intelligence (Shin Bet), the state and the court system, with the ultimate aim of providing the façade and apparent backing of a legal cover for what is considered in international law and most country laws as illegal. The Shin Bet was thus allowed to use whatever coercive measures – including physical and psychological torture – to exact ‘forced’ confessions from Palestinian prisoners over the course of six months, renewable by a court order without trial or charges. Khader Adnan, 37, from Jenin, was held under administrative detention law for years. Israeli intelligence had no evidence to indict him of any particular charge, despite accusations that he was a valued member of the Islamic Jihad organization. He was set free on July 12, 2015.This occurred only after he too resorted to undergoing several hunger strikes, and two particularly long ones: early in 2012 a hunger strike lasted for 66 days, and another, in May 2015, lasted for 56 days. Each time, Adnan reached the point where death, as is the case for al-Qeq, was also becoming a real possibility. When we asked him what compelled him to follow that dangerous path twice, his answer was immediate: “repeated arrests, the savagery of the way I was arrested, the brutality of the interrogation and finally the prolonged administrative detention”- without trial. Administrative detentions are like legal black holes. They offer no escape routes and no rights for the prisoner whatsoever, but wins the interrogators time to break the spirit of the prisoner, forcing him or her to surrender or even admit, under torture, to things that he or she never committed in the first place. “It is our last and only choice,” says Mohammed Allan, 33, from Nablus, who underwent a hunger strike for so long that it resulted in brain damage, and nearly cost him his life. “When you feel that all the doors are sealed, and you stand there humiliated and alone, knowing in advance that the court system is a charade, one is left with no other option but a hunger strike,” he says. “First, I made my intentions clear by refusing three meals in a row, and by sending a written note through the Dover (Hebrew for a prisoner who serves as a spokesperson for a prison ward).” Then, the punishment commences. It is like a psychological warfare between the prison authorities, state and legal system apparatuses against a single individual,” which, according to Allan lasts for 50-60 days. “Almost instantly, a hunger striker is thrown into solitary confinement, denied access to a mattress and blanket and other basic necessities. Only after six weeks or so, do Israeli prison authorities agree to talk to lawyers representing hunger strikers to discuss various proposals. But within that period of time, the prisoner is left entirely unaided, separated from the other prisoners and subjected to an uninterrupted campaign of intimidation and threats. Mental torture is far worse than hunger,” says Allan. “You cannot even go to the bathroom anymore; you cannot stand on your own; you are even two weak to wipe the vomit that involuntarily gushes out of your mouth into your beard and chest.” Allan almost died in prison, and despite a court order that permitted prison authorities to force-feed him (a practice seen internationally as a form of torture), doctors at Soroka hospital refused to act upon the instructions. In mid-August 2015, Allan was placed on life support when he lost consciousness. His severe malnutrition resulted in brain damage. A third freed hunger striker, Ayman Sharawneh, originally from Dura, Hebron, but who has been deported to Gaza, describes hunger strikes as the “last bullet” in a fight for freedom that could possibly end in death. Sharawneh, like Adnan and others we talked to, was bitter about the lack of adequate support he received while dying in jail. “All organizations, Palestinian or international, usually fall short,” he says. “They spring into action after the prisoner had gone through many days of torture.” He says that 2 years and 8 months after he was deported to Gaza, he is experiencing severe pain throughout his body, particularly in his kidneys. While undergoing the extended hunger strike “I started to lose my hair, suffered from constant nausea, sharp pain in my guts, threw up yellow liquid, then dark liquid, then I could hardly see anything. I had an excruciating headache and then I began to suffer from fissures all over my skin and body.” He agrees with Adnan that ‘individual hunger strikes’ should not be understood as a self-centered act. “Mohammed Al-Qeq is not striking for himself,” says Adnan. “He is striking on behalf of all political prisoners,” whose number is estimated by prisoners’ rights groupAddameer at nearly 7,000. According to Adnan, the issue of hunger strikes should not be seen as a battle within Israeli jails, but as part and parcel of the Palestinian people’s fight against military occupation. While the three prisoners affirmed their solidarity with Al-Qeq, they called for a much greater support for the hunger-striking journalist and thousands like him, many of whom are held indefinitely under administrative detentions. – Dr. Ramzy Baroud has been writing about the Middle East for over 20 years. He is an internationally-syndicated columnist, a media consultant, an author of several books and the founder of PalestineChronicle.com. Palestinian journalist Muhammad al-Qeiq announced Thursday his decision to continue his hunger strike in Israeli jails in protest at being detained in the Afula hospital. Al-Qeiq, who has been on an open-ended hunger strike for 73 days running, jotted down a note during a visit paid to him by his lawyer, following an Israeli court decision to suspend his administrative detention: “The court rule is just formal. It aims at pulling the wool over the world’s eyes. I will continue my hunger strike until I restore my freedom.” Live snapshots published by lawyer Ashraf Abu Esneineh from the Afula hospital show al-Qeiq as having gone through a remarkable weight loss. Earlier the Palestinian Prisoner Society (PPS) said in a statement the Israeli Supreme Court turned down al-Qeiq’s appeals to end his detention and ruled for only suspending his administrative detention. The PPS said the court rule is “unacceptable and serious” for it bears witness to Israel’s reluctance vis-à-vis al-Qeiq’s critical condition. Lawyers Iyad Mesq, Ashraf Abu Esneieh, and Kamel al-Natur, who attended the hearing, said the decision gives room for re-detaining al-Qeiq after he fully recovers, just as was the case with prisoner Muhammad Allan. They added that the court issued the decision only due to al-Qeiq’s critical health status. According to the lawyers, the Israeli occupation is taking revenge of al-Qeiq and turning deaf ears to his legitimate calls to end his administrative detention. Al-Qeiq’s family also expressed their firm rejection of the court rule dubbing it an attempt to hoodwink the public opinion by freezing the hunger-striker’s administrative term while keeping him locked up in the Afula hospital against his will. The family warned of Israeli intents to force-feed al-Qeiq and resume the administrative term after his recovery. Head of the prisoners and ex-prisoners’ committee, Issa Qaraqe, also said that al-Qeiq has initiated his hunger strike not only in protest at being held administratively in Israeli jails but also in protest at being treated by Israeli medics. The family of the Palestinian hunger-striker Muhammad al-Qeiq said Friday that their son has gone through a critical health turn in the early morning hours. Al-Qeiq’s family said the hunger-striker could not respond to those who were present with him at the hospital room. Al-Qeiq had earlier told al-Majd TV Channel in a phone interview that he would continue his hunger strike until he restores his freedom. Al-Qeiq expressed his gratitude to the campaign initiated in solidarity with him. He said the Israeli court rule to freeze his administrative detention while keeping him locked up in Israeli hospitals aim at thwarting the solidarity campaign. Al-Qeiq has been on a hunger strike for the 73rd day. He was arrested from his family home in Ramallah on November 21 and had reportedly been subjected to harsh torture during the investigation procedure, which made him declare his hunger strike. A video published, Thursday, revealed that hunger striking detainee, journalist Mohammad al-Qeeq, who started his strike 72 days ago, became barely able to speak or hear, lost a significant amount of weight, and is in a rapidly declining health condition. The video, filmed during a visit by Arab Member of Knesset Osama Saadi, showed al-Qeeq unable to even utter a few words, yet, saying his strike continues as long as he is held under arbitrary Administrative Detention, without charges or trial. Al-Qeeq was responding to an Israeli court decision to keep him held under Administrative Detention, without presenting any indictment against him, a decision solely based on the allegation of a “secret file,” -- a file neither the detainee, nor his lawyer, have access to. "The second phase has not started yet; nobody should ever think it is over," al-Qeeq stated, "I still have a long road ahead, and I will continue this path." Commenting on the court’s decision regarding ending his strike, without releasing him, al-Qeeq said; "They are trying to fool the world; however, I am ongoing with my strike for freedom; this strike will only end when am a free man in the West Bank." His statement about being a free man in the West Bank is meant to send a message that has no intention to accept any deal that would lead to his release in return for being forced into exile, or sent to Gaza, instead of returning home in Ramallah. Al-Qeeq works for the al-Majd TV, an Islamic channel in Saudi Arabia, and was repeatedly arrested and imprisoned by Israel and the Palestinian security forces. His latest arrest was carried out by the Israeli army on November 11, 2015, after the soldiers invaded his home. His wife, Faiha', who is also a journalist, said the soldiers surrounded their home, smashed several windows and doors, and violently searched the property before confiscating his mobile phone and computer. 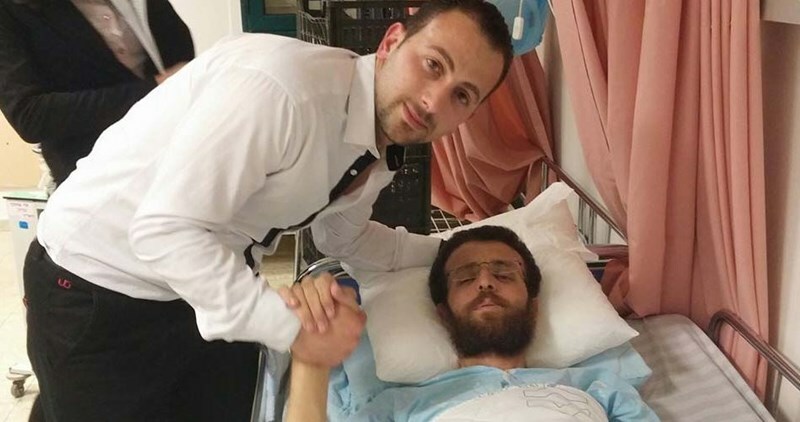 This morning, February 4, 2016, Dr. Mahmoud Mahamid, a member of Physicians for Human Rights-Israel (PHRI), visited Muhammad Al-Qeeq, who has been on a hunger strike for 71 days and is at imminent risk of death. Dr. Mahamid reported that Al-Qeeq's condition was extremely grave and that most of the conversation took place through notes because he could barely speak or even hear. Al-Qeeq reiterated his refusal to be examined or treated as long as he remains in administrative detention. The visit took place following the hospital’s ethics committee's decision last night to allow treatment of Al-Qeeq against his will, based on the deterioration in his health situation and the risk to his life. This decision contradicts medical ethics, which forbid the forced treatment of a competent and lucid person. However, in this case and in at least one more occasion, medical staff refused to force-treat Al-Qeeq as long as he was conscious and competent. This conduct is particularly encouraging since, as previously reported, medical staff did treat Al-Qeeq against his will a few weeks ago. PHRI calls to respect the medical teams' autonomy and professional judgment and not to exert pressure on them. The responsibility to save Al-Qeeq's life is entirely in the hands of the Israeli authorities, who have arrested him without charges or trial and must free him without delay. In addition, a hearing will take place today at the High Court of Justice following a petition submitted by PHRI against the shackling of Al-Qeeq to his bed, in contravention to procedures and despite his grave condition. The petition was submitted following the decision by the District Court to delay the hearing and avoid ruling on the organization's petition to remove the shackles despite its urgency. PHRI demands the immediate removal of the shackles which are being used time and again to break hunger strikers’ spirits. The condition of Palestinian administrative detainee who has been on a hunger strike for two and a half months has deteriorated in recent days, Haaretz reported Thursday. The ethics committee of Ha’amek Hospital in Afula convened Wednesday with representatives from the Israel Prison Service to discuss the case of Mohammed al-Qeiq, who has been on a hunger strike for 72 days to protest his detention without trial. Al-Qeiq is refusing any nourishment, including liquids. The hospital said that at this point it was merely monitoring his medical condition without intervening. It added that there were no plans to force-feed him. “All treatment is subject to the laws of the land and in keeping with medical ethics,” the hospital statement said. Attorney Jawad Boulos, who heads the legal department of the Palestinian Prisoners Society, told Haaretz that the ethics committee had convened because al-Qeiq’s medical condition had deteriorated in the past few days. The last report from Wednesday morning stressed that he was very weak and had difficulty speaking and hearing, but that he was conscious and aware and was refusing liquids or any other assistance. According to Boulos, because of al-Qeiq’s worsening condition, another hearing is to take place on Thursday to discuss the petition against his administrative detention and the request to release him due to his medical condition. According to Boulos, as of Wednesday afternoon there had been no contacts with the military prosecution regarding a possible deal, as had been arranged in the cases of previous hunger strikers Muhammad Allan and Khader Adnan. Meanwhile Wednesday, the Nazareth District Court postponed a hearing on a petition submitted by Physicians for Human Rights against the fact that al-Qeiq was tied to his bed and was otherwise restrained. The hearing has been rescheduled for next week. Demonstrations and vigils protesting al-Qeiq’s detention are being held throughout the West Bank and in front of the hospital. 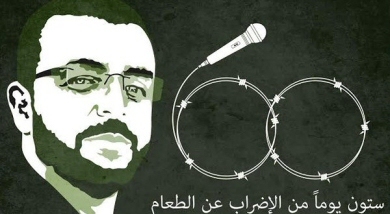 Israeli authorities have decided to forcibly treat hunger striking detainee, journalist Muhammad al-Qeeq, without his consent, according to Minister Issa Qaraqe, chairman of the Detainees and Ex-Detainees Commission. 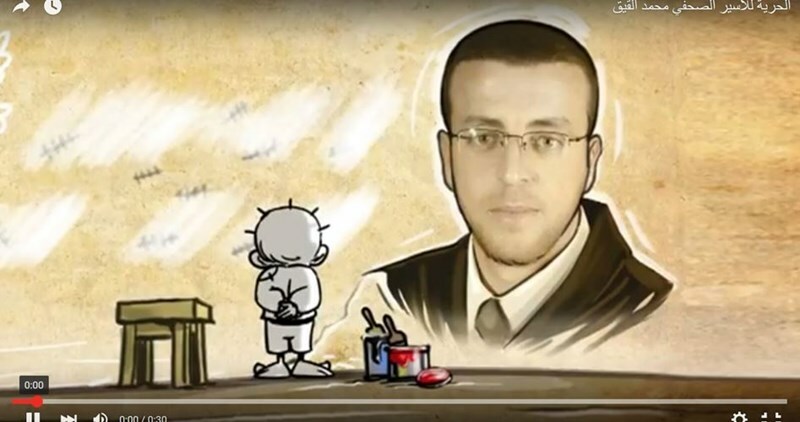 Earlier on Wednesday, the Israeli ethics committee at Afula hospital, where Palestinian detainee al-Qeeq is being hospitalized, said that he is on the verge of death, following 71 consecutive days of hunger strike in protest of being imprisoned without a charge or trial. 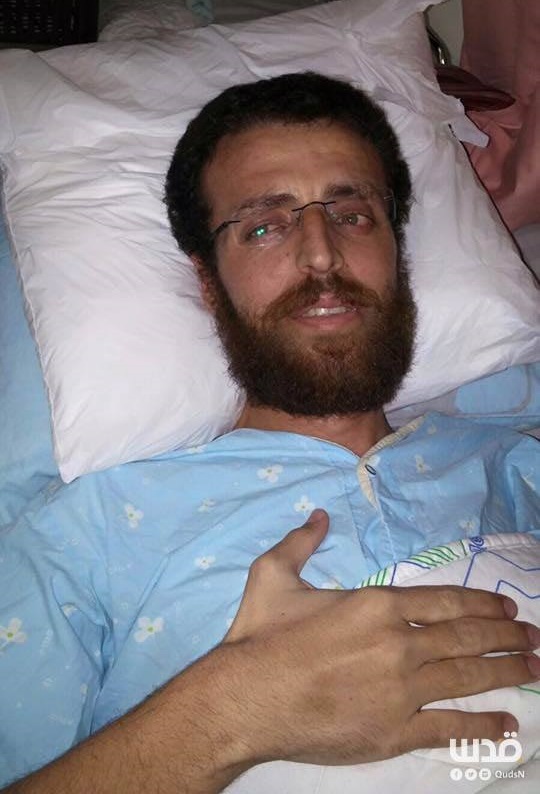 Iyad Mesk, an attorney with the Palestinian Prisoner’s Society (PPS), said that the Israeli ethics committee, composed of nine physicians, concluded that al-Qeeq’s health has reached a very critical stage and that he faces the possibility of death at any moment, stressing that even if he survives, he still remains at risk of a potential failure of various organs. The commission said that medical reports issued by Afula hospital are merely pro forma reports, given the fact that al-Qeeq has been rejecting to undergo any medical tests, including blood and Electrocardiogram (ECG) examinations. The commission also accused the Israeli Supreme Court of being an “accomplice” with the Israeli 'extreme right-wing government’, in its blatant disregard to al-Qeeq’s health deterioration. The World Medical Association, the Red Cross, and the United Nations, consider forced treatment a cruel, inhuman, and degrading treatment or punishment, and a blatant violation of international law and human rights. To be noted, on January 27th, 2016, the Israeli Supreme Court fixed al-Qeeq’s administrative detention term, without charge or trial, for six months, despite his critical health condition. In a statement issued on Tuesday, the United Nations Coordinator for Humanitarian Assistance and Development Aid, Robert Piper, expressed grave concern over Israel’s continued practice of administrative detention, without charge or trial. The UN official reiterated 'the United Nations' long-standing position that all administrative detainees – Palestinian or Israeli - should be charged or released without delay’. The Israeli government continues to refuse to release Palestinian journalist Muhammed Elqeiq who has been observing an uninterrupted hunger strike for the 70th day running. On Monday, Elqeiq’s wife and family met with Palestinian Prime Minister Rami al-Hamdallah, urging him to use whatever leverage the Palestinian Authority (PA) might have to save Muhammad’s life. Al-Hamdallah told them Israel was behaving with total callousness and vindictiveness and refusing to cooperate. “All that Muhammed did was reporting reality in Palestine to the outside world. And Israel is trying to kill him for doing this. That is the whole story”, she said. Fayhaa, herself a journalist, appealed to colleagues around the world to identify with her husband. “We pray that Muhammad will survive this ordeal. Muhammed doesn’t want to die. He is evidently clinging to life. His triumph will be good news for journalists around the world, and his defeat, God forbid, would be a serious setback for press freedom and freedom of speech around the world. “That is why we appeal to our colleagues around the world to press and pressure the Israeli government to release this innocent man immediately. On Monday, the Israeli High Court decided to keep Muhammed Elqeiq in administrative detention pending a further deterioration of his health conditions. The Israeli Attorney-General is adamantly refusing to submit any tangible evidence that would indict the detained Palestinian journalist. “The administrative detention is a sword constantly drawn against Palestinians’ throats, which allows the Israeli occupation authorities to incarcerate Palestinian activists without charge or trial up to 12 years. Elqeiq was working for the Saudi Satellite TV outlet, al-Majd, before he was arrested. Israel considers unfavorable reporting of events in the West Bank, such as home demolitions, human rights violations and other acts of repression an act of incitement. “Israel classifies us Palestinians into either terrorists or informers. There is nothing in between. Thus, a journalist like Muhammed Elqeiq who is just doing his job is viewed as a terrorist,” Hammam Elqeiq, Muhammad’s brother, said. Hamas Movement said Tuesday that any serious development in al-Qeiq’s health condition will cost Israeli authorities a high price, saying that Israel must take Palestinian Captive Movement’s threats into consideration. The leader in the Movement Abdel-Rahman Shadid said in a press release issued Tuesday that the Captive Movement in Israeli jails warned Israel that it would pay a very high price if anything bad happened to al-Qeiq. The Captive Movement’s threats came after medical reports raised alarm bells over al-Qeiq’s serious health deterioration, Shadid pointed out. The prisoners have realized that Israeli authorities deliberately ignore al-Qeiq’s hunger strike, he continued. Palestinian prisoners had declared on Tuesday a one-day hunger strike in solidarity with Mohamed al-Qeiq who entered his 71st day of hunger strike in protest against his administrative detention. Meanwhile, the Palestinian Prisoners Society (PPS) revealed that Afula Hospital administration released Tuesday afternoon a second medical report about al-Qeiq’s condition as his health situation continues to deteriorate. Releasing two medical reports in the same day proves the critical stage reached by al-Qeiq, Jawad Bolous, the PPS’ lawyer, pointed out. Bolous said that al-Qeiq renewed on Tuesday his rejection to take any medical treatment or vitamins despite his difficult health condition. Earlier Tuesday evening, Israeli authorities allowed for the first time a Palestinian doctor to visit him in Afula Hospital on Thursday. The Israeli decision to allow a Palestinian doctor’s visit to al-Qeiq came after the massive efforts made by Physicians for Human Rights Organization in this regard over the past period. Along the same line, al-Qeiq’s lawyer Ashraf Abu Sneineh said that Israeli authorities allowed Tuesday only one lawyer to meet him although three lawyers used to meet him daily. Prisoner al-Qeiq initiated his hunger strike under the slogan “Free or Dead” in protest at being held administratively in Israeli occupation jails, with neither charge nor trial. 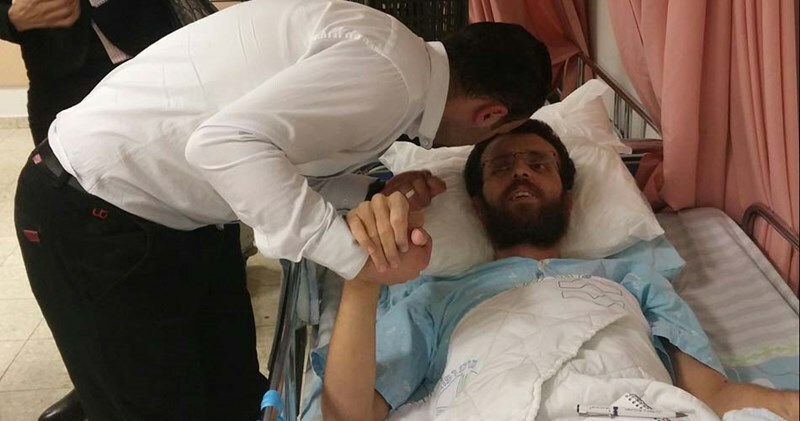 Israeli doctors in Afula Hospital warned that the hunger striker Mohamed al-Qeiq is at risk of suffering a stroke due to his sharp health deterioration, his lawyer affirmed. The lawyer Ashraf Abu Sneineh pointed out that the recent medical reports released by the hospital administration affirm the critical stage reached by al-Qeiq. He is now suffering from acute pain and inflammation in his legs and hands after he lost his ability to speak and hear, the lawyer said. Earlier Tuesday evening, Israeli authorities allowed for the first time a Palestinian doctor to visit him in Afula Hospital next Thursday. The Israeli decision to allow a Palestinian doctor’s visit to al-Qeiq came after the massive efforts made by Physicians for Human Rights Organization in this regard over the past period. Israeli authorities are scheduled on Thursday to decide over al-Qeiq’s case as his health situation continues to deteriorate. Meanwhile, the leader in Hamas Movement Nazih Abi Oun stressed the need for an urgent intervention to save al-Qeiq’s life before it is too late. Abu Aun pointed to the Captive Movement’s recent statement in which it threatened Israel that it would pay a very high price if anything bad happened to al-Qeiq. Israeli authorities must take these threats into consideration, he underlined. 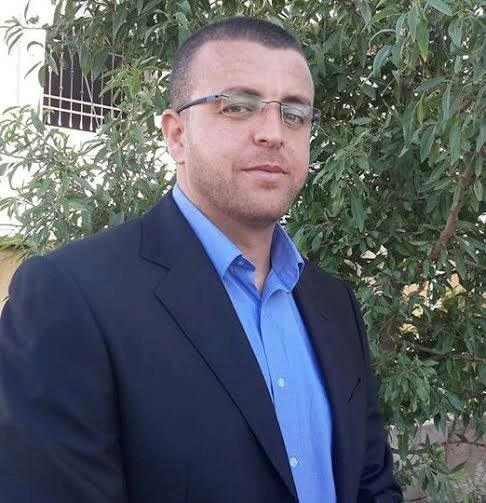 Muhammad al-Qeiq, a 33-year-old journalist from the occupied West Bank village of Dura, launched his hunger strike on November 24 in protest against his administrative detention, a practice in which Israel imprisons Palestinians on "secret evidence" and without trial or charge. Hunger strikes are a common tactic for Palestinian prisoners to secure their release or to protest against the conditions of their imprisonment.